In one of the world’s most naturally beautiful, unspoilt places. 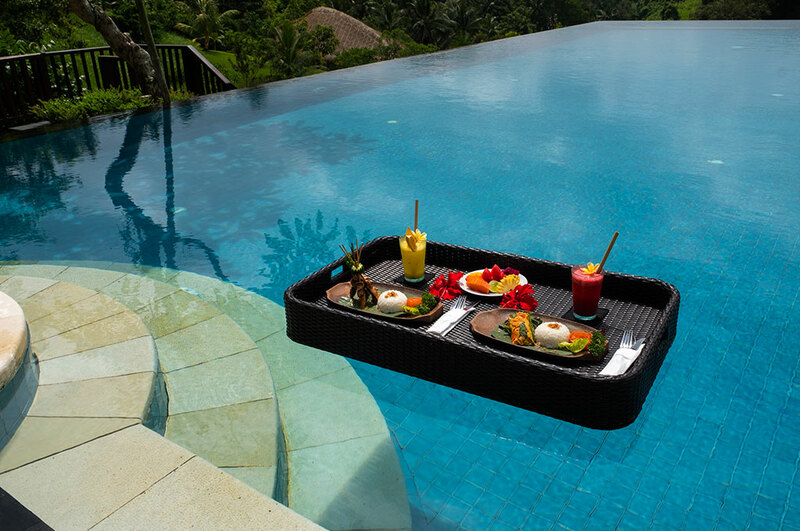 Amori Villas is a small, luxury hotel with a wellness focus. 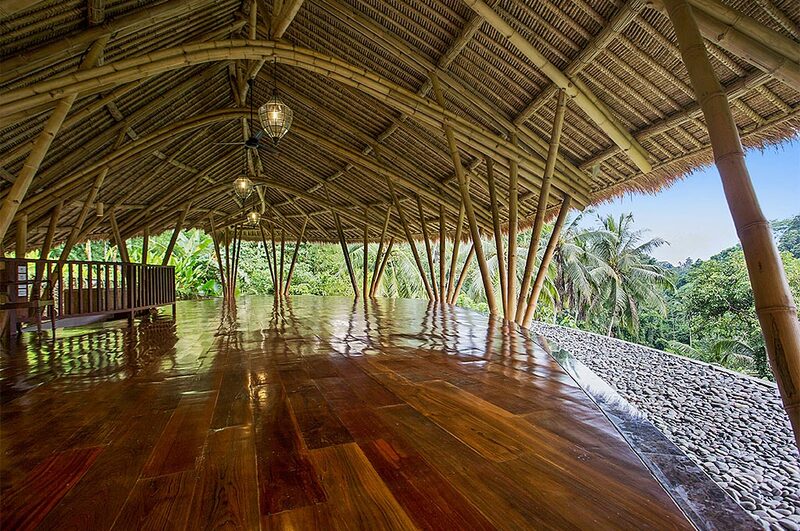 Retreat leaders enjoy exclusive use of all facilities and staff for their most special yoga and wellness retreats. 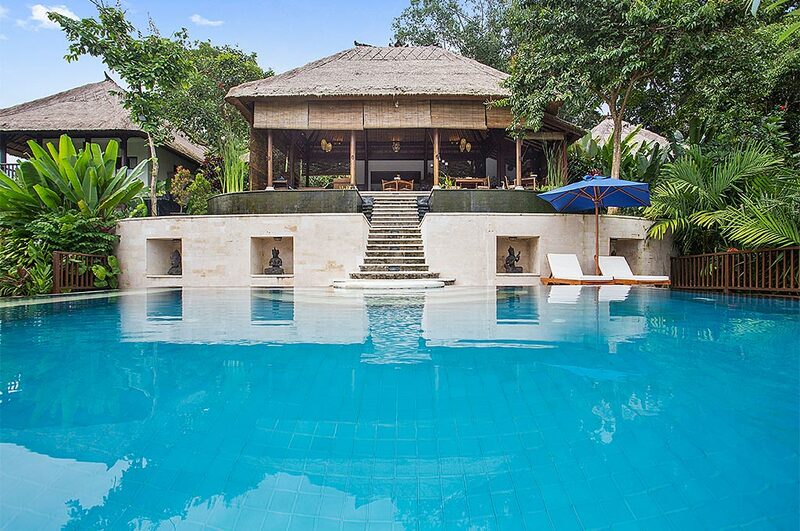 Want real Bali? 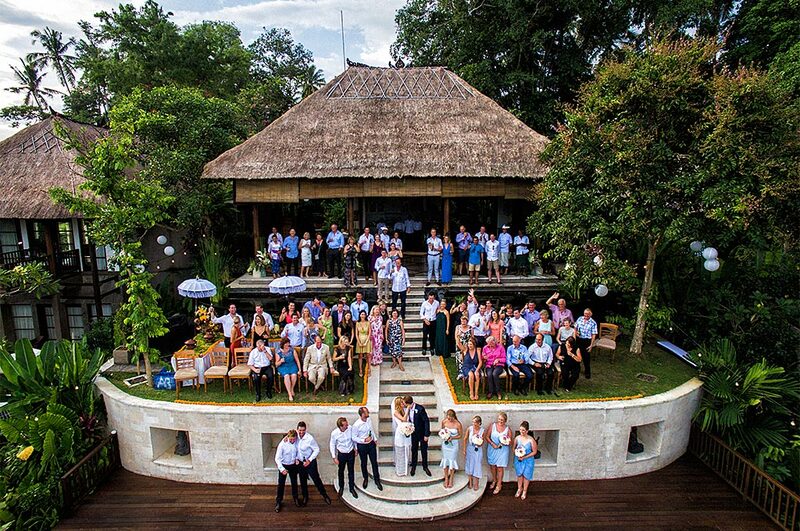 Choose Ubud and Amori Villas. 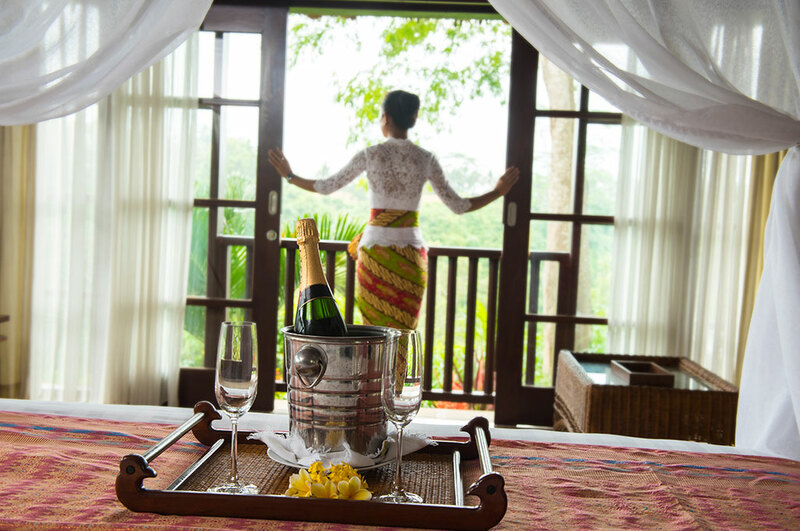 Enjoy homely, personal service from butlers, chefs and spa therapists. Immerse yourself in Amori’s peaceful natural setting, the sounds of the river and the infinity pool, with Amori’s serene, smiling staff. 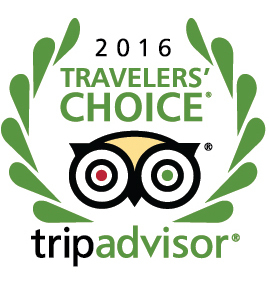 Amori is much more than high-quality accommodation and service. 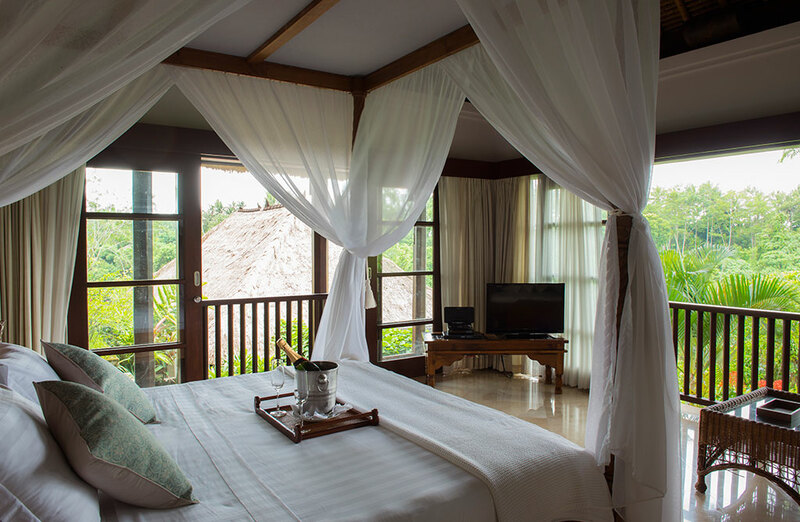 Amori Villas is intimate and personal – with only 7 suites and villas – designed to suit groups booking the whole property; couples for their special holiday; or individuals coming for a wellness retreat. 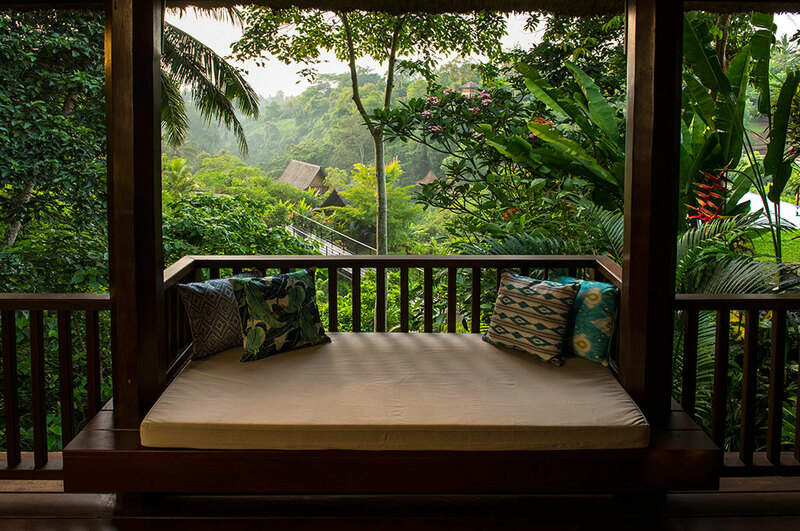 Amori was created with the love and passion of two well-travelled Australians who split their time between Perth and Ubud. They know what you want when you are on holidays. 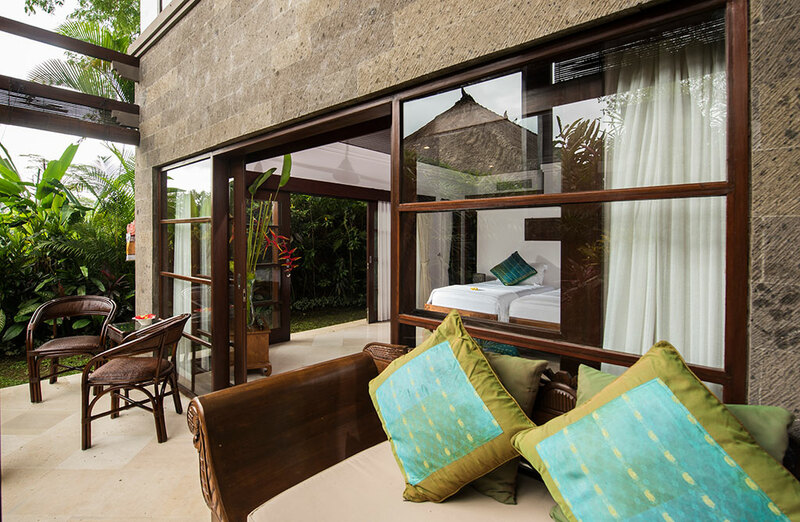 Amori Villas is architecturally impressive and provides all the comfort and luxury that you want. 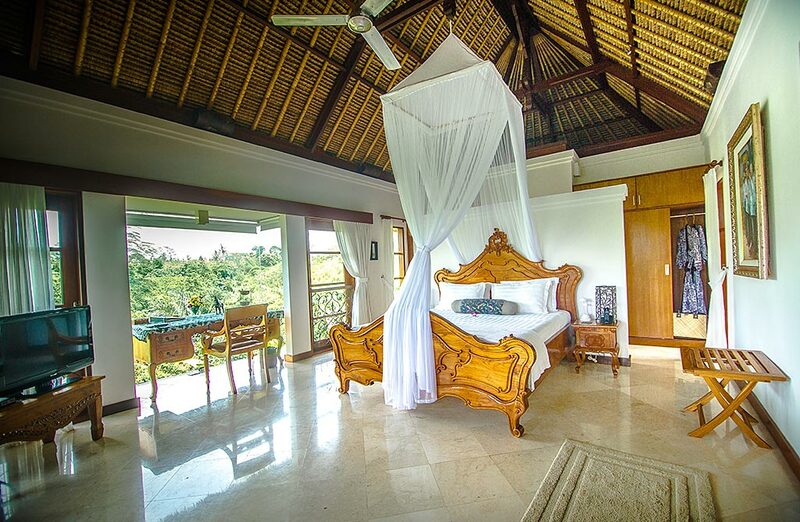 Marble bathrooms; spacious bedrooms; infinity pool; vaulted ceilings; eco yoga pavilion; cool spa treatment rooms; organic kitchen gardens and lush tropical landscape. Our guests say that the photos don’t do it justice. 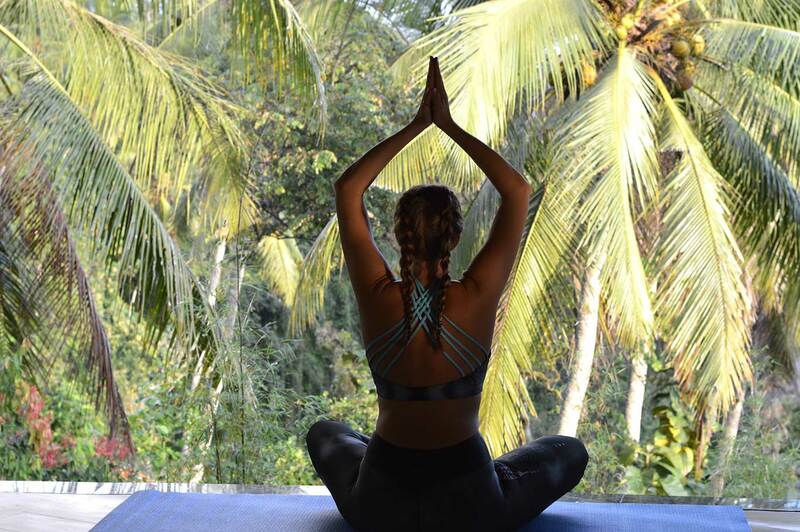 An Amori Retreat is an enjoyable, personal journey of self discovery, harnessing body and mind, and enhancing spiritual perspective, in one of the world’s most naturally beautiful, unspoilt places. 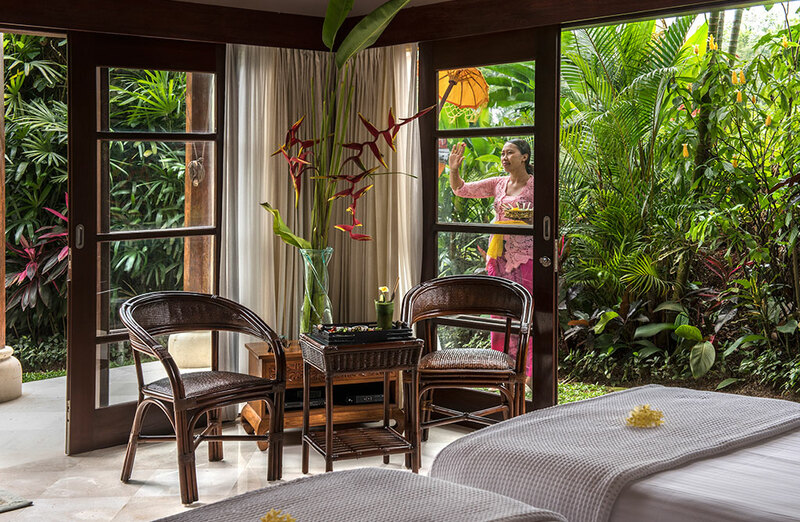 Enliven your body, mind and spirit with Amori’s wellness and healing experience. 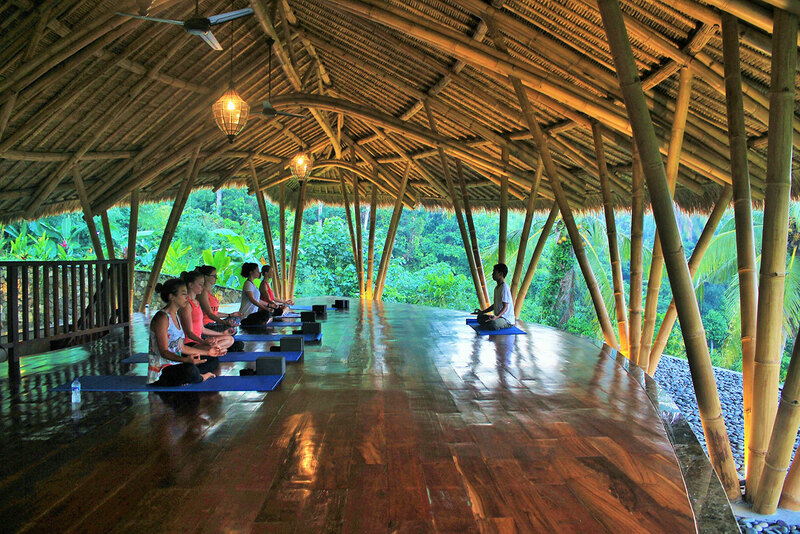 De-stress and improve your lifestyle by combining the enriching values of yoga, exercise, massage and diet. Leave Amori refreshed, rejuvenated and motivated. 3 nights of luxury accommodation. Your choice of room options. 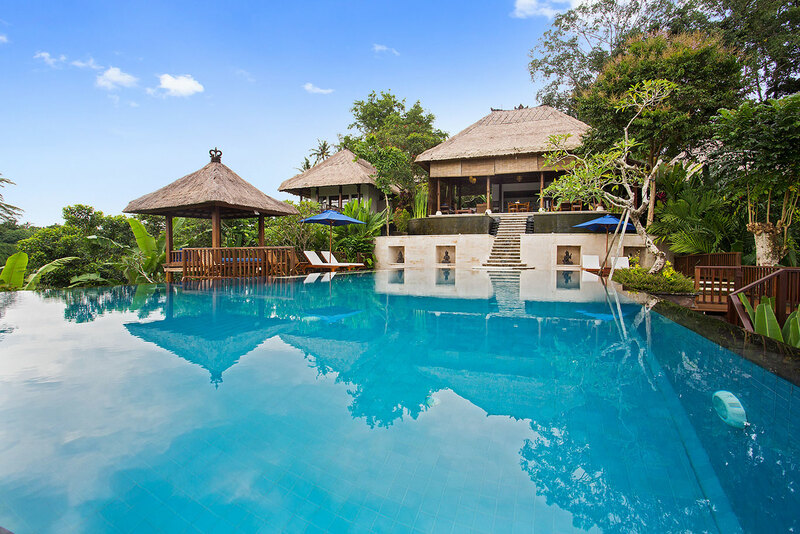 Yoga and wellness retreat leaders and their groups can enjoy exclusive use of Amori Villas, its staff and facilities – the accommodation, open-air restaurant and lounge pavilion, the purpose-built, eco-designed, multi-purpose shala and spa building. 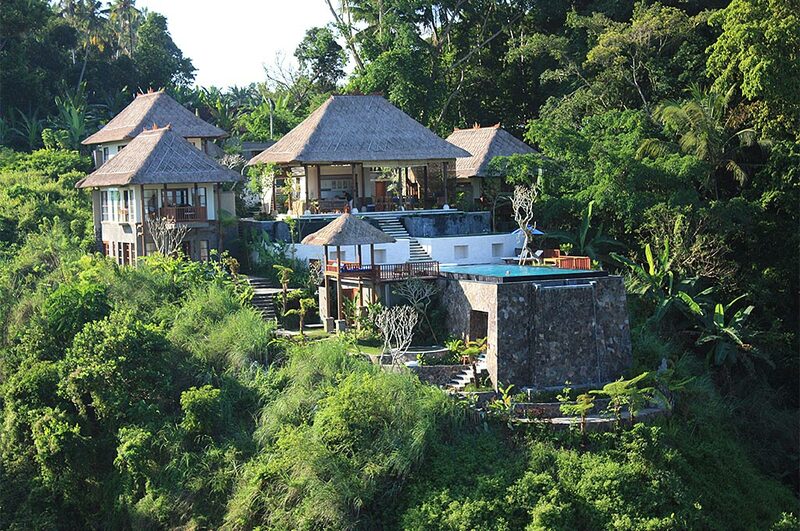 Amori is a luxury option compared to other retreat properties in Bali. 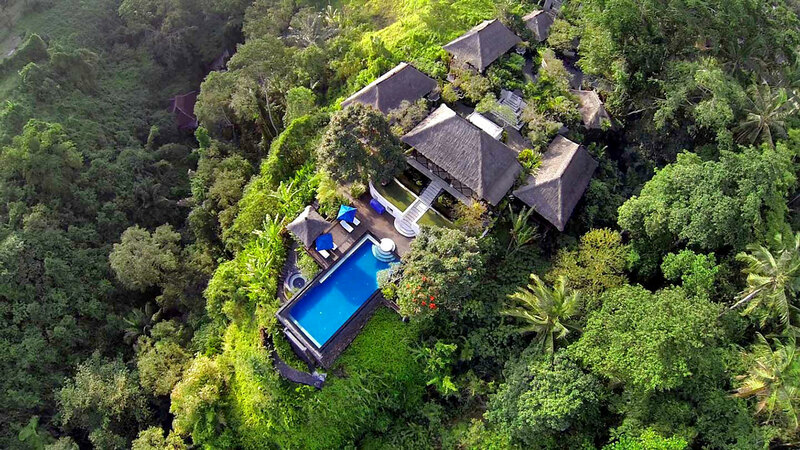 Apart from the comfort of the rooms and the infinity pool, it is in a truly magical location and is also within very close reach of Ubud. 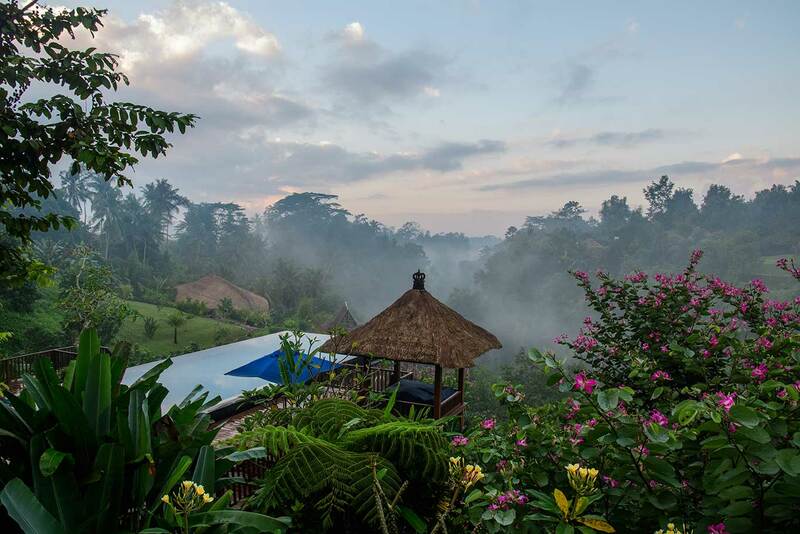 Amori’s special differences are its location (bringing spirituality/ aura); its connection to the sacred Petanu river; the amazing, uplifting yoga space; the exceptional personal service from our local staff; and the immersion in our local Banjar (neighbourhood). This is all part of The Amori Experience. Please enquire for available dates in 2019 and 2020. Testimonials and references can be provided from previous group leaders. Opening out to the gardens and valley, and close to the pool and jacuzzi/ hot tub, this suite is perfect for those who love a swim before breakfast. 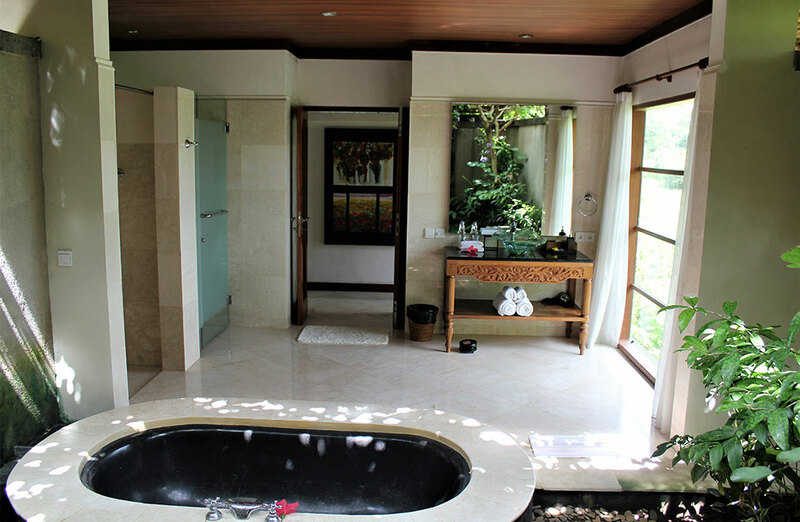 The beautifully appointed bathroom features marble flooring and a cream terrazzo bath with its own views. Essentials – airconditioning, ceiling fan, TV, DVD player, sound dock, desk, hairdryer, makeup mirror. Bedding options: King-size Double, Twin or Triple. * US Dollars. Double/twin. Excludes high season. 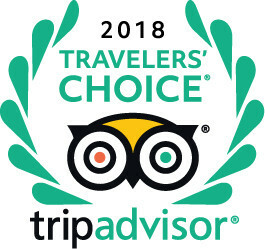 21% service fees and taxes apply. 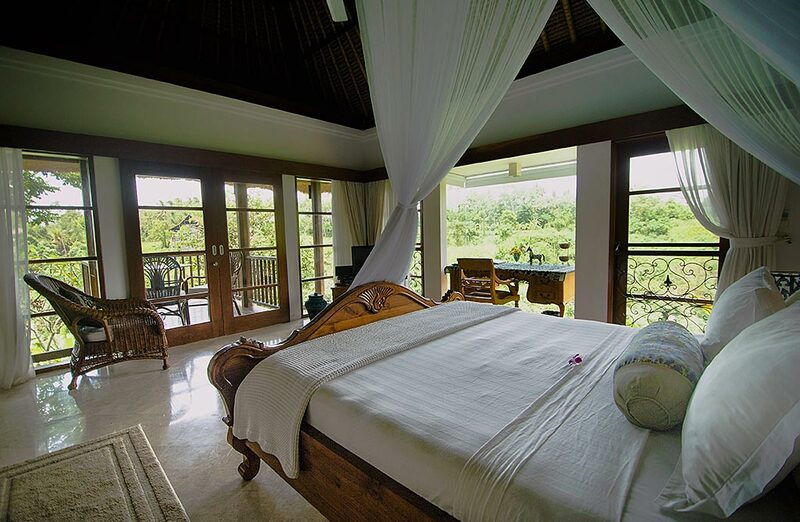 The views from this suite will bring instant peace and relaxation. Whether it is from the “stargazing balcony”, the desk in the bay window or from the elegant king-size bed – pictures don’t do it justice. 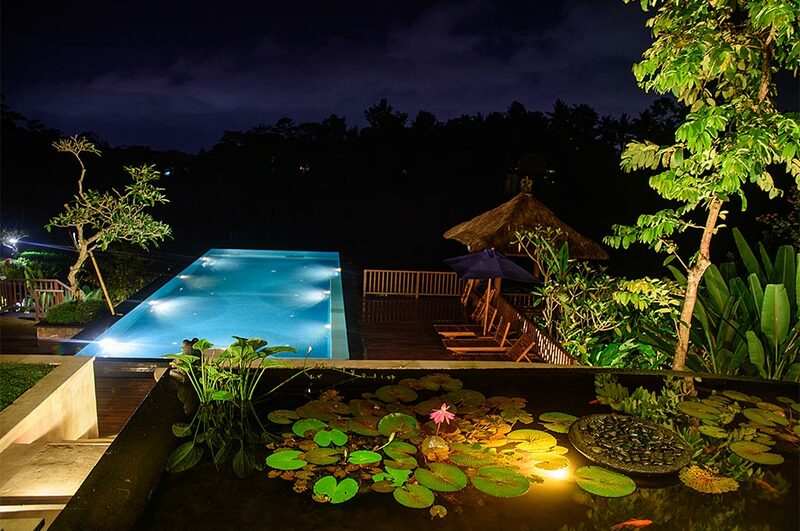 Or if that is not enough, you have secluded luxury with an indoor/ outdoor bathroom to die for – viewing window to the valley, choice of two showers, a huge sunken terrazzo bath and fish pond with water feature. A romantic dinner for two on your balcony is highly recommended. Essentials – air-conditioning, ceiling fan, mosquito netting, TV, DVD player, sound dock, desk, hairdryer, makeup mirror. * US Dollars. Double. Excludes high season. 21% service fees and taxes apply. This suite has everything you might want, except for views and a bath. 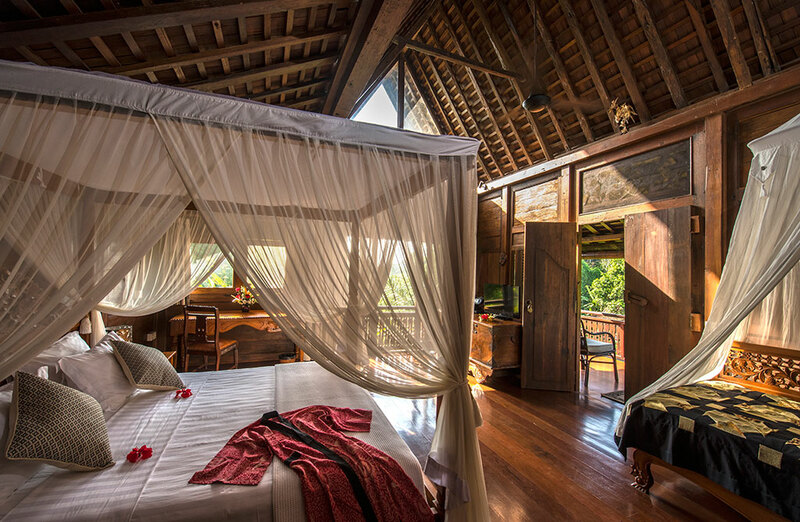 It is extremely private and perfect for couples where one is a reader and the other prefers to watch TV. 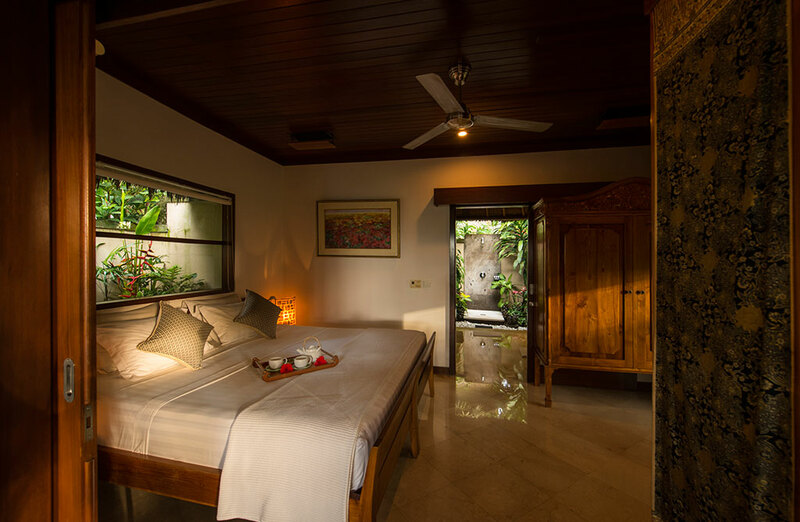 It is spacious – 50 sq m of bedroom and bathroom, plus another 40 sq m of garden and walled courtyard. 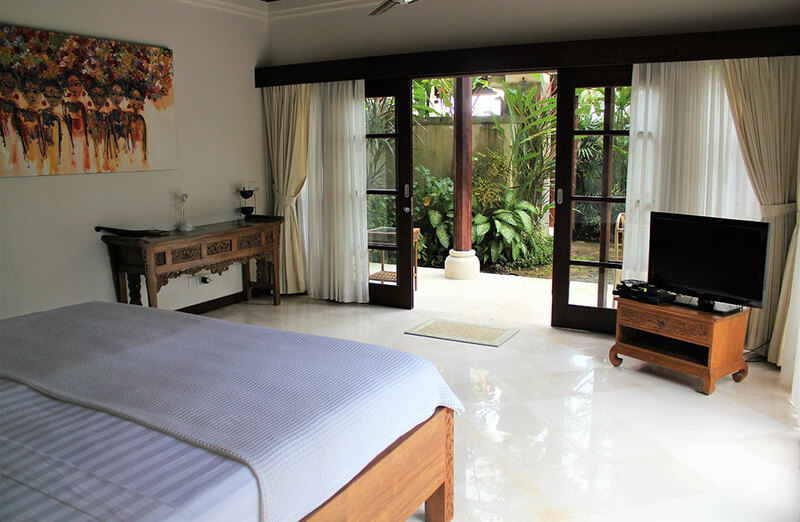 The beautifully bright bedroom has double sliding doors on two sides, opening onto the garden. 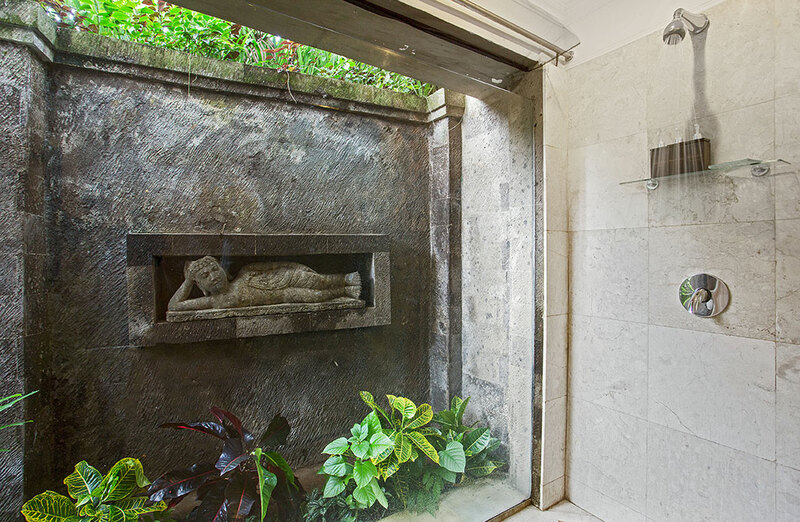 And the large, fully-marble bathroom also has a garden window. 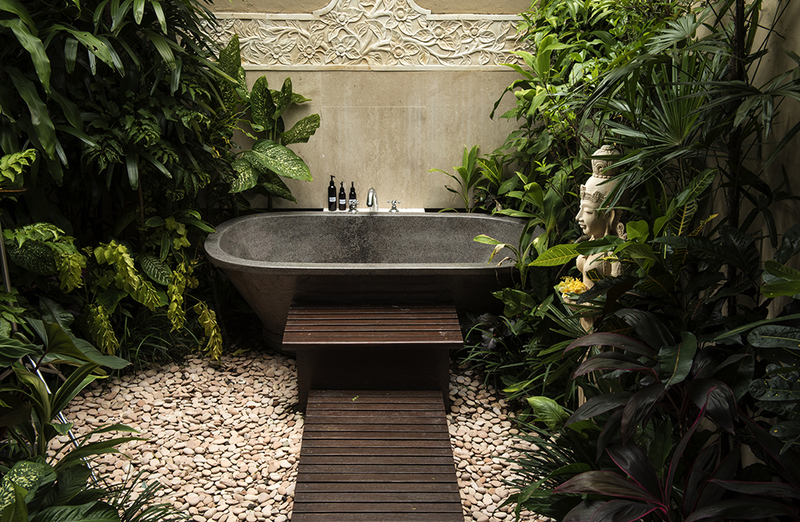 Dreaming of a 4-poster bed and a Balinese massage, followed by a fragrant flower-petal bath in a beautiful terrazzo bath? Being at Amori’s highest point, you will have panoramic and relaxing views from everywhere in the bedroom and the bathroom. 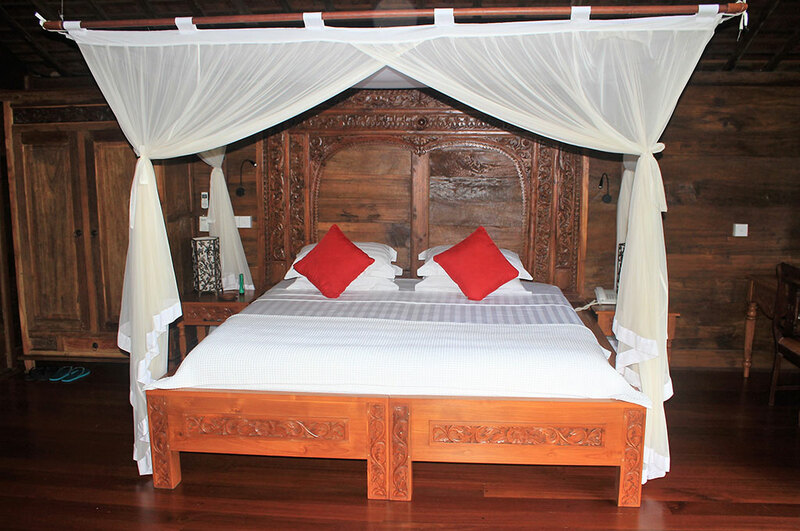 The Honeymoon Suite is spacious and very comfortable for quiet reading or watching movies from your 4-poster bed, etc. Butler service is just a phone call away. Essentials – air-conditioning, ceiling fan, mosquito netting, TV, DVD player, sound dock, hairdryer, makeup mirror. 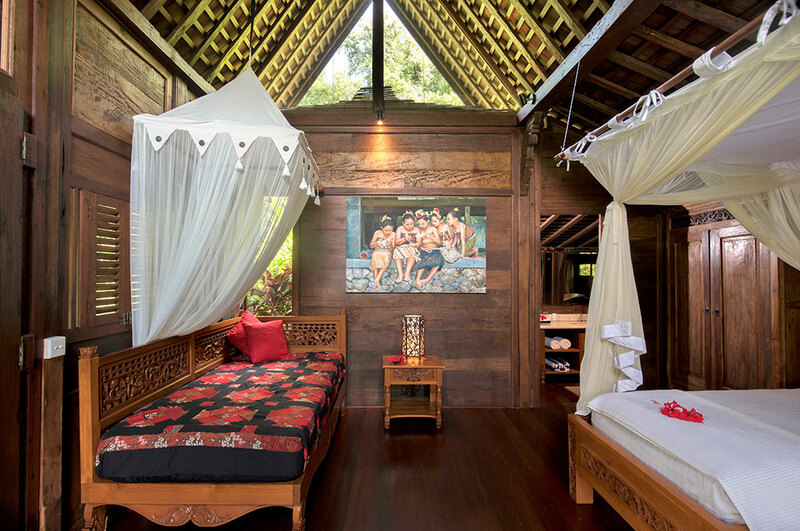 Privately and peacefully set amongst the lush tropical trees, Amori’s one-bedroom villa can sleep a family of 4 or 5. Or is it spacious luxury for two? 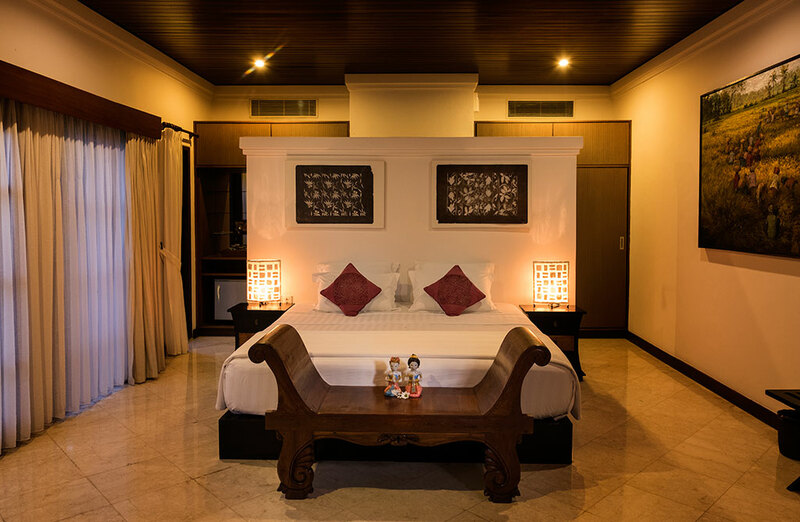 Apart from the king-size double/twin bedroom and enormous indoor/outdoor bathroom, there is a separate lounge and verandah with day bed. 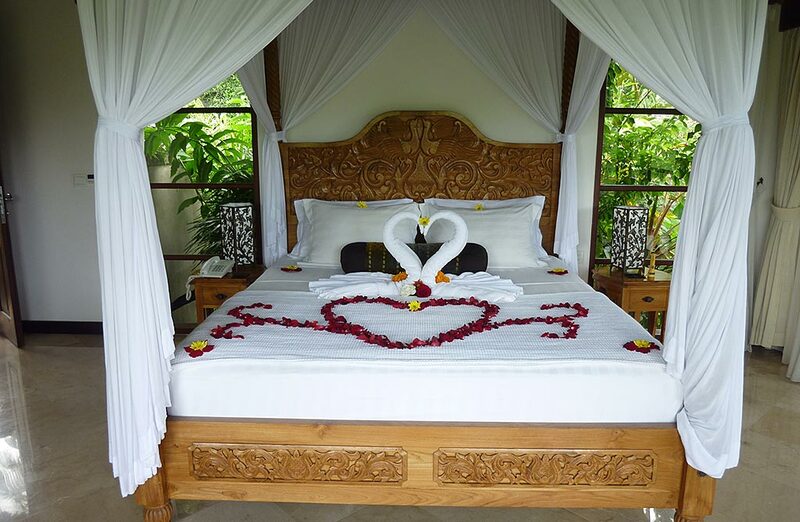 This is your home away from home….with housekeeping and butler service. Essentials – air-conditioning, ceiling fan, TV, DVD player, sound dock, desk, hairdryer, makeup mirror. Bedding options: King-size Double or Twin, plus double sofa-bed and/or extra single bed. 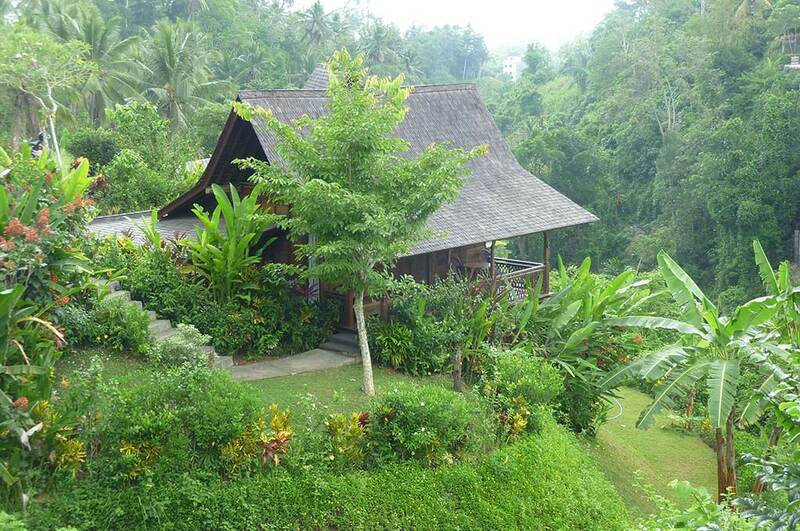 Amori’s Classic Villas are located on sloping land overlooking the river, with amazing deep valley views. 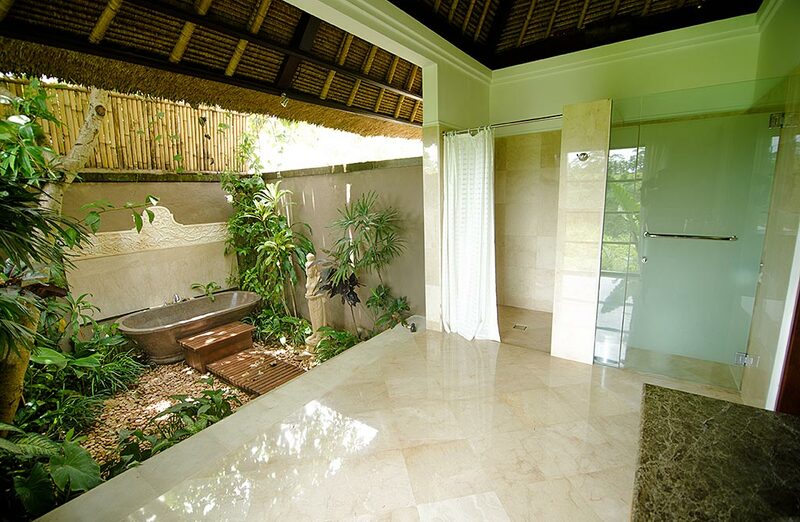 The setting is harmonious with the surrounding nature and it provides peace and privacy. Kingfisher Villa is a traditional gledag or wooden house, rebuilt using the original timber. The wood creates a lovely warmth and homely feeling. There is a very large bedroom with king-size double bed, which could be made into a twin, a daybed/extra single bed, and space for another single bed. 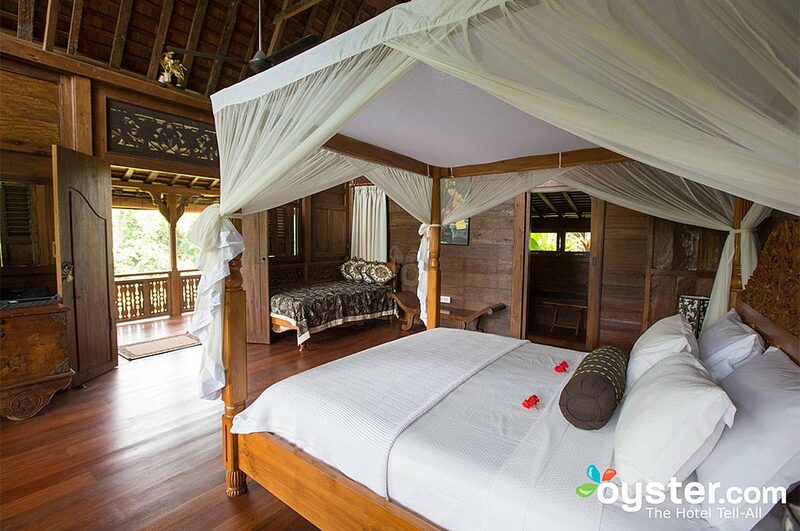 The bedroom has both air-conditioning and a ceiling fan. There is a TV, DVD player, sound dock and a desk. 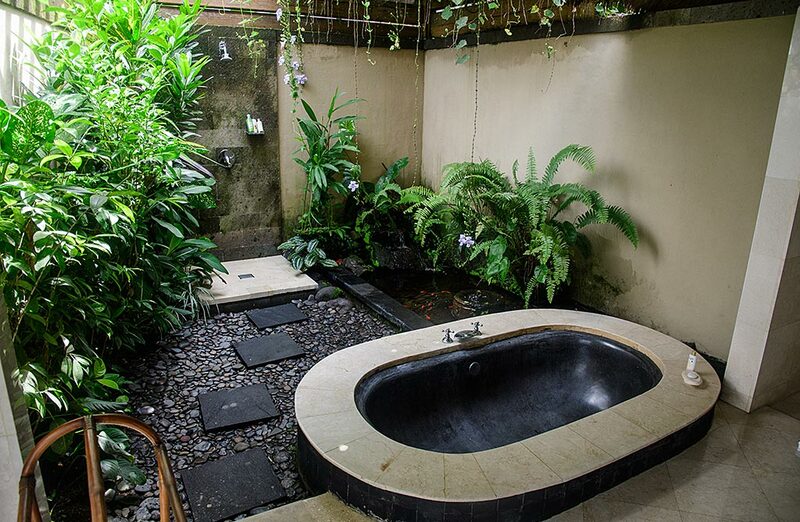 The bathroom/ dressing room is large and offers a shower and a generous bathtub. 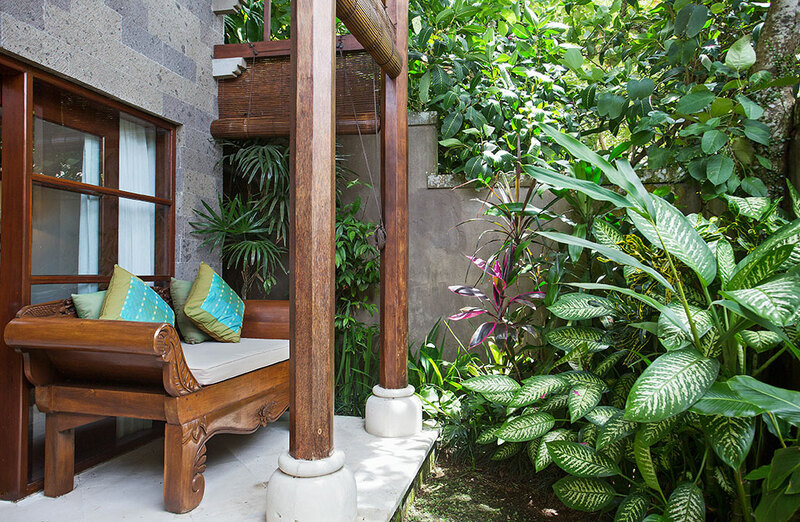 For reading, relaxing and dining, you have your own verandah with a settee and table/chairs. 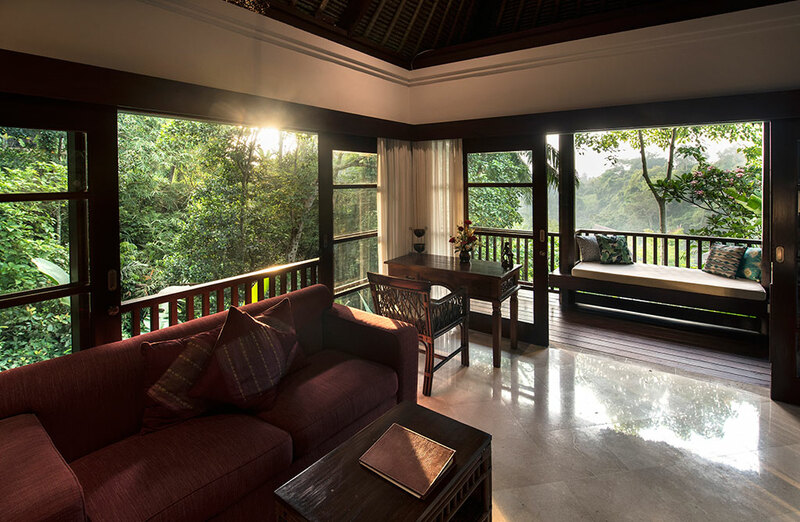 Amori’s Classic Villas overlook the river, with amazing deep valley views. 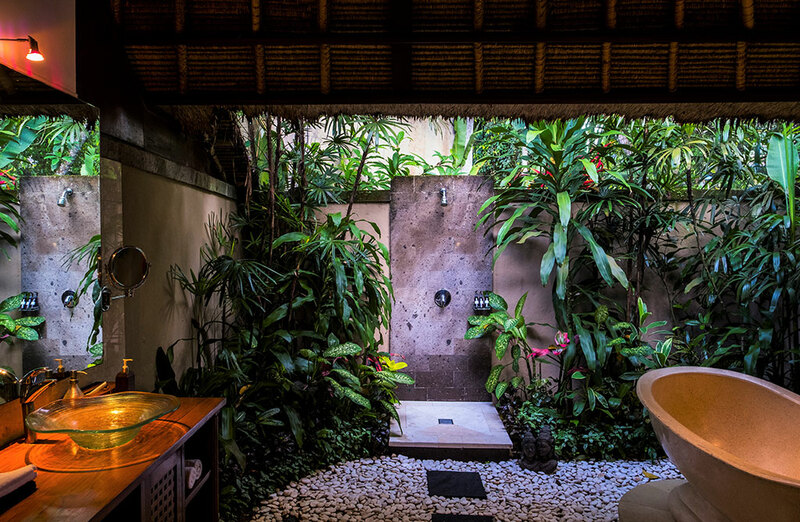 Connect with the surrounding nature and enjoy peace and privacy. 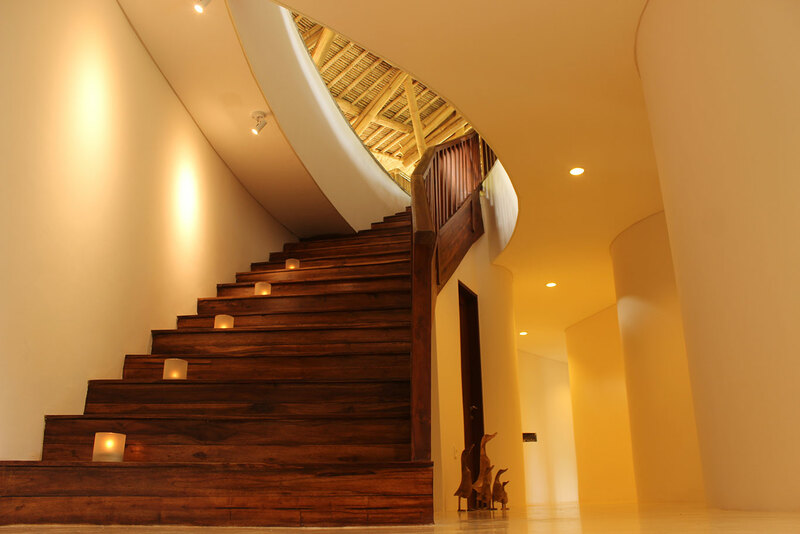 Heaven Spring Villa is a traditional gledag or wooden house, rebuilt using the original timber. The wood creates a unique experience and feeling. There is a very large bedroom with king-size 4-poster canopy bed, a daybed/extra single bed, and space for another single bed. The room has both air-conditioning and a ceiling fan. There is a TV, DVD player, sound dock and a desk. The bathroom/ dressing room is large with a shower and elegant claw-foot bath… with a reading lamp. 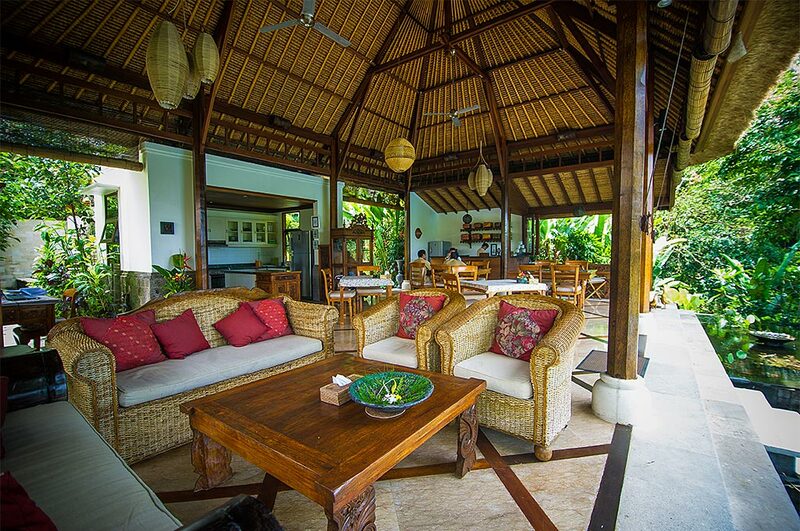 For relaxing and occasional dining, there is a verandah with a settee and table/chairs. Click here . . . to ask us any questions to help you to decide. We will reply within 12 hours, probably much less. Welcome drink, cooked snack and refreshing towel on arrival. A-la-carte breakfast. Choice of Continental, American, Asian or Health-lovers. Table service or room service. 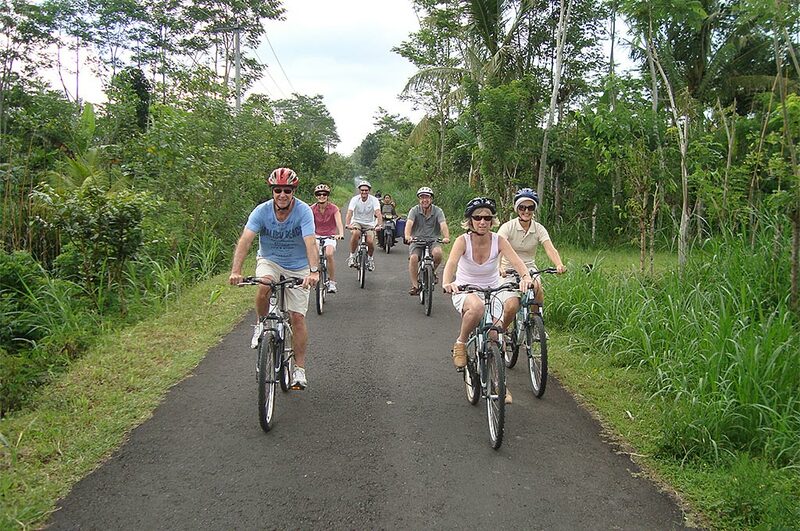 Car shuttle services to and from Ubud centre. (10 minutes). Unlimited supply of spring water. Free, unlimited wi-fi internet throughout the property. Complimentary airport pickup for 3 night stay, and two-way transfers provided for 4 nights or more – for direct website bookings. Prices are in US Dollars and exclude tax and service charge totalling 21%. Room rates shown above are for two persons. 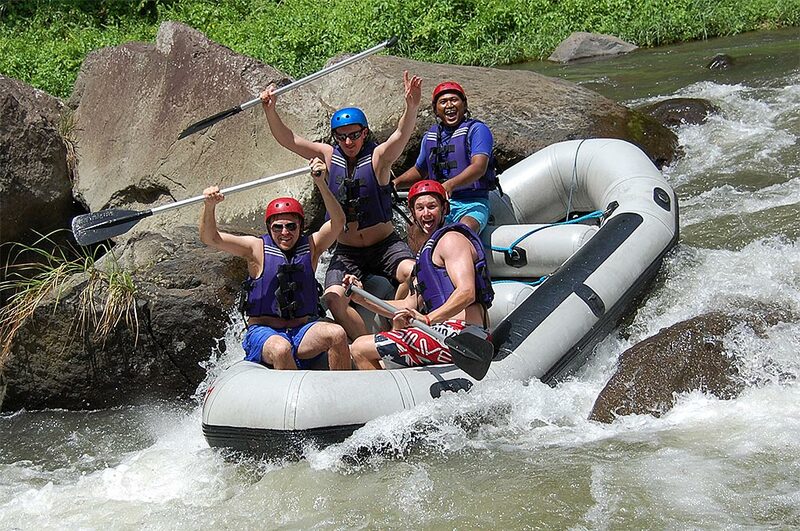 Each extra person is an additional cost of 50 USD per night. Extra children, 16 years or younger, are an additional cost of 40 USD each per night. 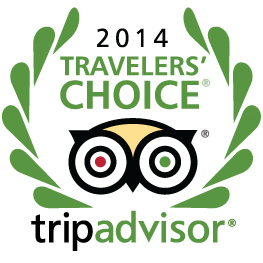 For infants of 2 years or less a charge of 15 USD per night applies. Using the Booking Button above will ensure that your booking is automatically confirmed. Details of your credit card will be received securely. A deposit of 50% of the total accommodation charges will be processed manually, despite what is suggested by the words in the automatic booking confirmation you will receive. When a deposit has been processed a confirmation and receipt will be emailed to you. Cancellation – free up to 14 days before arrival – to view policy click on a booking button and scroll to the bottom of the room details page. Amori Spa services both Amori Villa guests and non-guests. 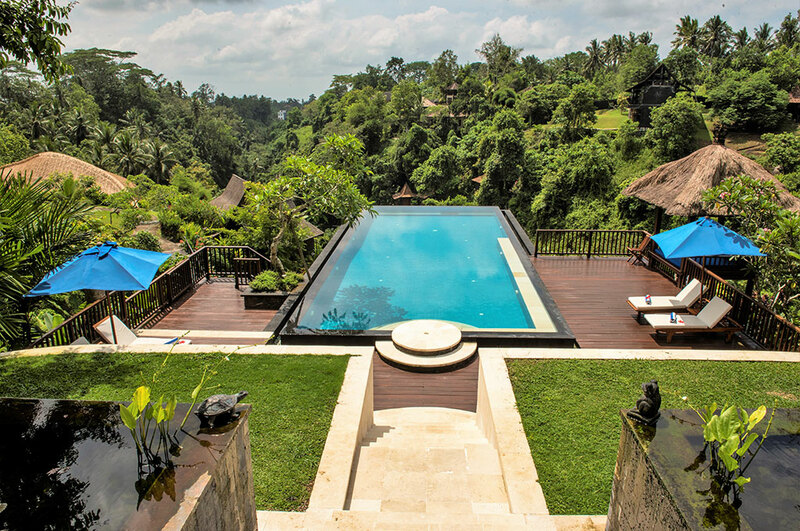 It is peacefully located close to the sacred Petanu River valley in the far corner of the Amori Villas estate, hidden below the yoga pavilion. 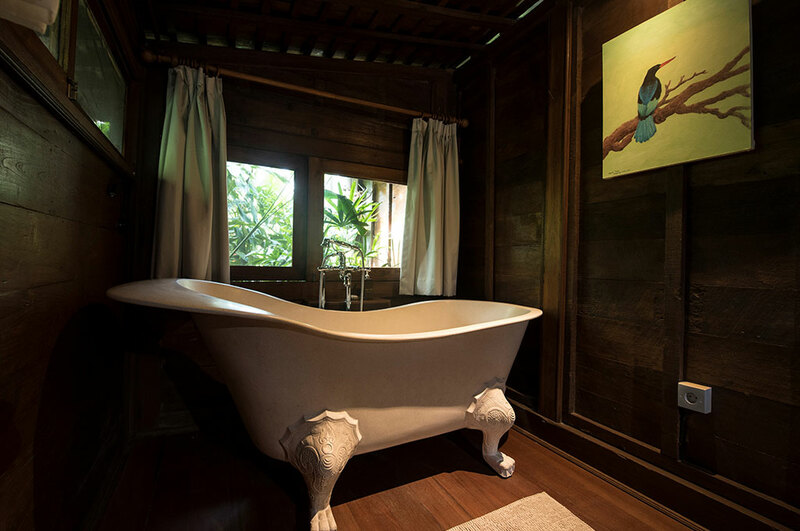 There are two single treatment rooms with their own showers, plus a double room with both shower and bath. 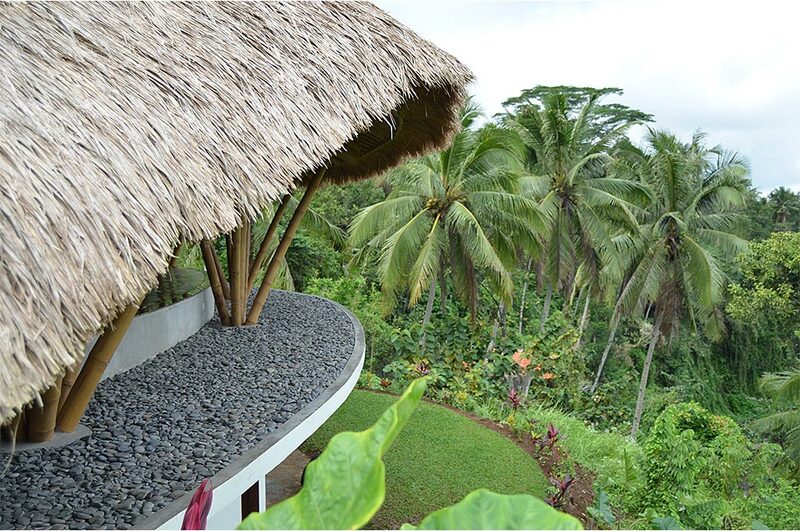 All have relaxing views to the greenery beyond. All Amori Spa therapists have been carefully selected and are very well trained. We guarantee that you will love your treatment.